The Palace of the Governors as it appears today. Originally constructed to house the first Spanish royal governor of New Mexico, Don Pedro de Peralta, the Palace of the Governors in Santa Fe reflects the complex heritage of the American Southwest. Erected c. 1610, it is the oldest extant public building constructed by European settlers in the continental United States having survived four centuries of use and architectural evolution. 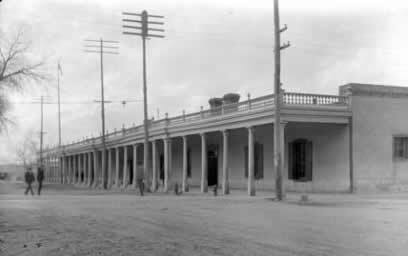 The Palace remained the home of Spanish, Mexican and American governors throughout the three countries’ control of the New Mexican territory until 1907. The building was the capitol of New Mexico and the governor's residence during the Spanish Colonial era (1610-1680; 1693-1821) and the Mexican period (1821-1846). After the American occupation (1846) and subsequent formation of the New Mexico Territory, the Palace was the territorial capitol until 1886 and governor's residence until 1909. 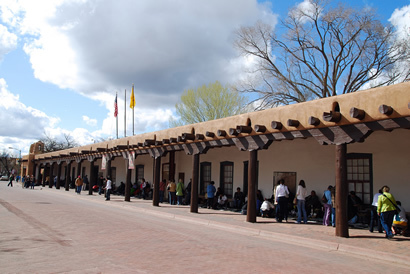 The native Pueblo Indians occupied the Palace of the Governors (1680-1693) during the Pueblo Revolt, and the Confederacy (1862) during the Civil War. The building reflects both Native and Spanish methods of construction and is an important example of the Spanish-Pueblo-Revival style with Territorial elements. A National Historic Landmark for both its historic and architectural significance, and part of the Museum of New Mexico, the Palace is open and interpreted for visitors daily. In the mid-1500s, Spaniards in New Spain (today Mexico) began taking an interest in the vast territory to the north. Several early exploratory missions made contact with indigenous peoples living along the Rio Grande River and its tributaries. In 1598, the Spanish Governor Don Juan de Oñate led an expedition to establish the first permanent Spanish settlement within the northern territory. He and 130 colonists founded a small village called San Gabriel de Yunque-Ouinge, which Oñate deemed the Spanish capital for the area. Oñate’s successor, Don Pedro de Peralta, arrived in San Gabriel in the winter of 1609, and aiming to establish a strong, permanent capital, moved the remaining colonists to a better location. He founded the new capital of Santa Fe in 1610, in what is today northern New Mexico – a location with natural resources protected by the foothills of the nearby Sangre de Cristo Mountains. Santa Fe has changed dramatically over time. 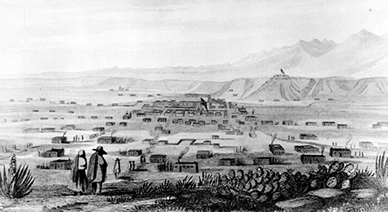 Above the city is shown in the 1840s with the center of town in the distance, near the base of the Sangre de Cristo foothills. Spanish law dictated the overall appearance of new towns. Rules stipulated that each community have a central plaza on which the main institutions of church and state were to be constructed. Thus, Peralta ordered construction of the Palace of the Governors on the town square’s northern end. The Spanish surrounded the plaza with several other casas reales (royal government buildings) as well as a fort, military chapel, carriage house, servants’ quarters, warehouses, and a tannery. By the late 1600s, Spain’s encomienda system of forced labor and the insistence of Catholic conversion caused the Pueblo people to revolt against Spanish rule. During the 1680 Pueblo Revolt, many Spaniards fled to the capital, Santa Fe, and took refuge within the Palace of the Governors. When the Indians cut off their water supply, the last remaining settlers escaped south back to New Spain, and the Pueblos Indians occupied Santa Fe. From 1680 to 1692, in the Spaniards' absence, Pueblo leaders took up residence in the Palace. They constructed a three or four story pueblo-like structure atop the existing building, the first of many architectural alterations to the Palace of the Governors over its long history. Approximately 1,000 Pueblo residents would come to reside in the amalgamated building. When the Spanish returned to New Mexico in the 1690s, they demolished most of the Pueblo additions and returned the building to its more traditional, Spanish form. Around 1790, the Spanish built a large fortification (or presidio) to protect Santa Fe from increasing American Indian attacks. The presidio enclosed the square, including the Palace of the Governors, with a rectangle of structures, which had only one entrance on the southern side. Quarters for troops, various guardhouses, and corrals surrounded the compound. The Palace of the Governors, within the presidio, remained the political capitol building in New Mexico throughout the remainder of Spanish colonial rule. In 1821, when Mexico became an independent nation, the Palace continued to be the seat of civil and military government in New Mexico. Santa Fe was originally highly isolated, but that changed, and new relaxed border laws led to an era of prosperity. The city became an important stop on trade routes south toward Mexico City and east to the growing United States. The Santa Fe Trail brought in an influx of traders along with their specialized goods and varying cultural traditions. The Palace of the Governors benefitted with the installation of glass windows for the first time. Glass was a commodity frequently brought west from the United States. The building housed customs and duty processing quarters and frequently held a vendor market along its west end. It retained this critical economic importance for the decades leading up to the American annexation of New Mexico. 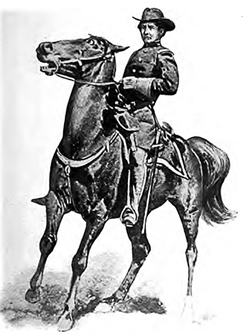 On August 19, 1846, General Stephen Watts Kearny and his Army of the West took control of New Mexico in the name of the United States. He raised the American flag over the Palace of the Governors after the last Mexican governor, Manual Armijo, abandoned the territory without a fight. The first American legislature met in the Palace halls in 1847, complete with a seven-member council (Senate) and a 21-member House of Representatives. After the Americans took over, the Palace would remain the seat of the New Mexican Territorial Government through the mid-1880s, with only a brief period of Confederate occupation during the Civil War in 1862. At the turn of the 20th century, the building was not only the governor’s residence and home to the capital’s legislative halls, but also housed the secretary and governor’s offices, the territorial library, servants’ rooms, storerooms, a carriage house and stables. When the railroad entered New Mexico in 1879, the main line bypassed the capital, instead heading south to the larger city of Albuquerque. Santa Fe suddenly lost the economic and social preeminence afforded it by the Santa Fe Trail. During the early 1880s, the possibility of moving the capital city elsewhere arose. The construction of a new capitol building in 1885, however, allowed Santa Fe to remain the government seat of the territory into the 20th century. The Palace of the Governors has gone through many architectural and stylistic evolutions. Above, the façade c. 1900 before restorations returned the building to its former Spanish-Colonial appearance. After the legislative functions moved into the new capitol building, the Palace continued to house offices and the governor’s residence. A historical society within its walls regularly displayed exhibits for the public. When the final residing governor moved out of the building in 1909, the legislature voted to turn the Palace of the Governors over to the School of American Archaeology and the newly created Museum of New Mexico, which still control the building. The 400-year-old Palace of the Governors at the northern end of the historic Santa Fe Plaza is a large, one-story building, primarily Spanish-Pueblo Revival in style, with some Territorial-style elements. Due to its constant use and changing occupants, the building is an amalgamation of many different eras. The block-long façade dates from a 1913 restoration that sought to highlight Spanish-Colonial features. These include a lengthy portal (porch), plaster-coated walls, and large wooden vigas (log roof beams) which stick out of the walls at the roofline. The Palace is quite large and extends back, away from the plaza. Single-story rooms surround a beautiful interior courtyard and patio. Most walls are of adobe brick, sometimes several feet thick, with tan-colored, cement stucco coating. The Palace of the Governors is the largest artifact of the popular New Mexico History Museum -- an adjacent three-story building that shares its campus with the Palace of the Governors Photo Archives and Fray Angelico Chavez History Library. The buildings feature a wide array of exhibits relating to the precontact, Spanish, Mexican, and Territorial periods of New Mexico's history. Docent-led and self-guided tours are available. The Palace of the Governors is a National Historic Landmark located on W. Palace Ave. on the plaza in downtown Santa Fe, NM. Click here for the National Historic Landmark file: text and photos. The Palace is home to the New Mexico History Museum, which is open Tuesday through Sunday from 10:00am to 5:00pm, except Fridays when it remains open until 8:00pm. For more information, visit the New Mexico History Museum website or call the front desk at 505-476-5200. The Palace of the Governors has been documented by the Historic American Buildings Survey and is featured in the National Park Service American Southwest Travel Itinerary and El Camino Real de Tierra Adentro National Historic Trail Travel Itinerary.